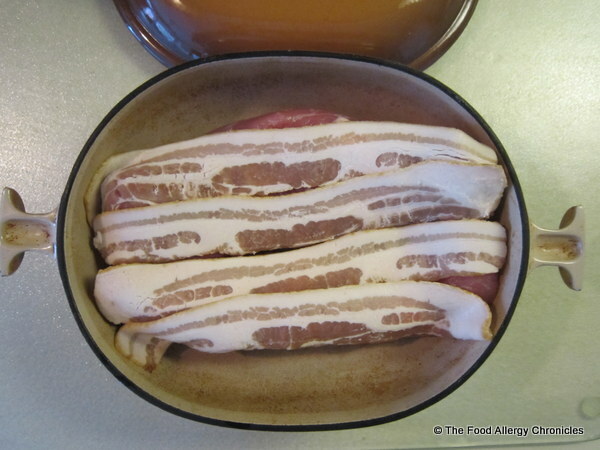 Posted on October 17, 2012 by Susan H.
Pork Tenderloin Wrapped in Bacon. This is a recipe my mother used to make when I was growing up. So fun to be serving it to my family. 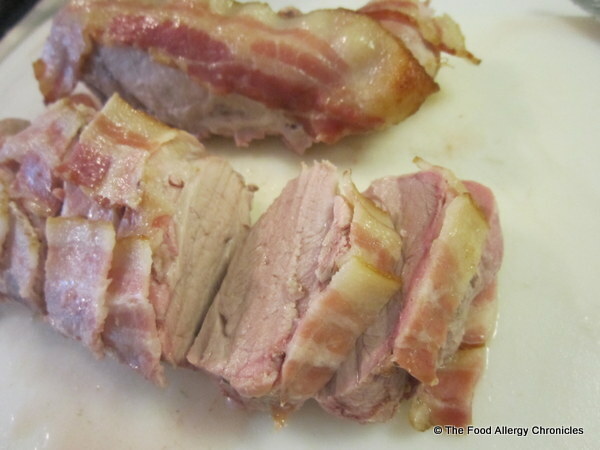 I know, it seems silly, in a way, to be posting such a simple recipe, however, my blog, The Food Allergy Chronicles is about chronicling our life…Pork Tenderloin Wrapped in Bacon is a big part of our allergy friendly meal repertoire! I repeat…everyone in the family likes this…hence, no grumbling at the table. I tend to always have pork tenderloin frozen individually in the freezer, onions and a package of Schneider’s Country Naturals Bacon in the fridge…three simple ingredients for this dish. No need to salt…just add a little cracked pepper and possibly a sprinkle of dried sage. Easily put together ahead of time to just pop in the oven…served with a side of rice or potatoes and a vegetable…the perfect meal is ready in 45 minutes. In a baking dish, arrange the sliced onions, place the pork tenderloin on top, sprinkle with sage and cracked pepper (if using), and arrange bacon slices to cover pork tenderloin. Bake, uncovered, at 350 F for 45 minutes or until the internal temperature is 71 C.
Remove pork tenderloin from baking dish to a cutting board and tent with foil. Let rest for 5-10 minutes while the juices settle. Slice and serve with onion and bacon slices. The boys love their Pork Tenderloin Wrapped in Bacon with rice. This particular evening, the vegetable was the last of the corn…Matthew passed on the roasted brocolli…and of course, a side of ketchup. 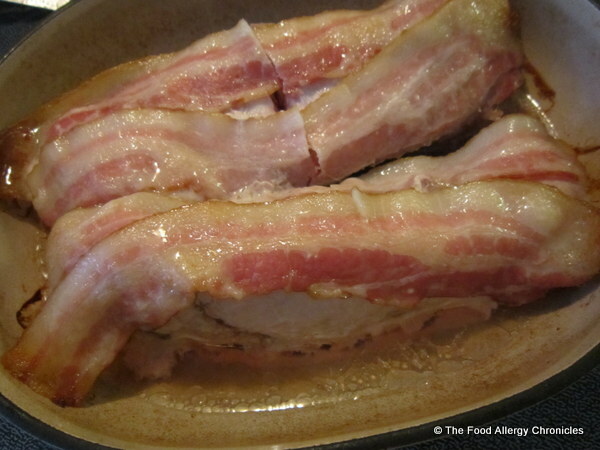 Tip 1: I sometimes cook a couple extra pieces of bacon on the bottom of the baking dish…boys like extra bacon. 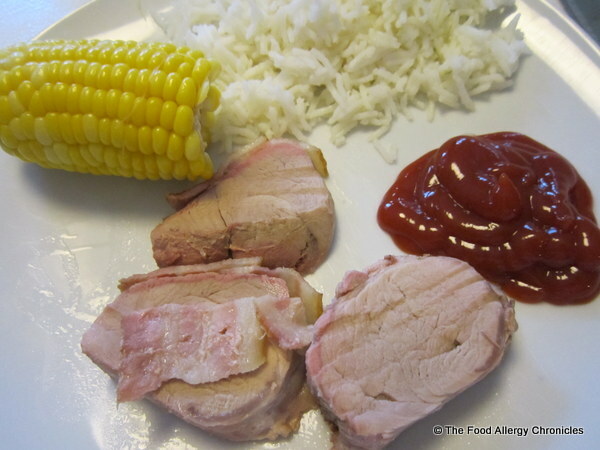 Tip 2: As the boys appetites are growing, I baked 2 pork tenderloins…any leftovers are perfect for another meal or lunch. Do you have a favourite family go-to meal that everyone enjoys? 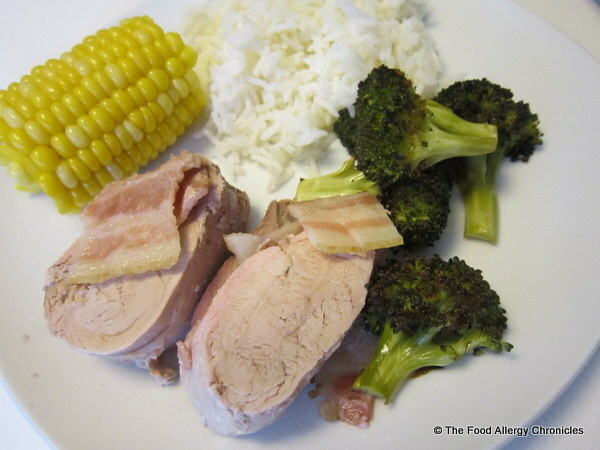 This entry was posted in dinner, multiple food allergies and tagged an allergy friendly dinner, Pork Tenderloin Wrapped in Bacon, Schneiders Country Naturals Bacon by Susan H.. Bookmark the permalink.